Like most of us, Chris McCane wasn’t sure what he wanted to do at 18 years old. But McCane wasn’t sure that was going to work for him. So, he looked for some alternative options. In August 2008, McCane signed up to serve his country. Now, 10 years later and out of the military, McCane is a senior associate business systems analyst at Workday and a graduate of the Career Accelerator Program (CAP), a paid internship that helps military veterans transition into civilian careers, with the potential to be hired as a full-time employee following successful completion of the program. CAP is part of the Opportunity Onramps initiative, a movement dedicated to creating economic opportunity for all. We sat down with McCane to learn more about his journey. Tell us about your Army career. I enlisted in the Army and got on a plane to South Carolina for basic training. At first, I thought to myself, “What did I get myself into?” But basic training helped me hone in on who I was on the inside. I finished in January 2009 and was assigned to a unit in Germany; in June, I was deployed to Iraq. After a year there, I had seven more months of service in Germany, where I met my wife, Jasmine. We eventually moved our family to Fort Benning, Georgia, and later, Fort Shafter, Hawaii. I started out as an HR specialist, but by the end of my military career, I was wearing many different hats. The most gratifying moments in the service were when I was pulling mail in Germany and Iraq. I got to witness deployed soldiers receive care packages, letters, and mail from home. Those are the moments I’ll remember the most. What did the Army teach you about yourself? Before the Army, I didn’t realize that I could be disciplined, hyper-focused, or accomplished. It all started to become easier with the help of the Army. I felt like I was given the tools to be successful and most importantly, it helped me understand what’s important. The Army helped me focus on the present. Being in the Army also taught me a lot about sacrifice, especially once we had our three kids. By the end of my service, I’d sacrificed time with my family, other career opportunities, and even stability. Sacrifice helped me realize how truly important the work-life balance really is. When did you decide to transition to civilian life? My family and I wanted to put down roots. With the Army, that’s hard to do. Everything always felt temporary, even the little things—we would debate whether or not to hang pictures on the wall or paint a room. I’d felt the Army had served its purpose in my life by giving me my foundation, and I was ready for the next adventure. Our family returned to the Bay Area in 2016, and I started to look for new opportunities. How did you find the CAP program? Before I left the Army I started talking to my dad, who has lived in Silicon Valley for the last 30 years. I was leaning on him for advice on how to get from one career to another. 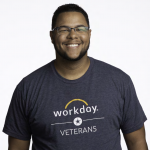 Eventually, I got that “yes.” Through my networking, I was referred to CAP, which is a 16-week paid program that opens up career opportunities for military veterans at Workday. What did you learn from CAP? I went into CAP with the mindset that every day is a job interview. I needed to be able to show my value to the team, and I did my best to absorb as much as possible. I knew there could be an opportunity for full-time hire at the end of my internship as a systems analyst, but I had to prove I belonged. Throughout the program, my goal was to pick up something from the more experienced members on my team and put it on my plate. What I appreciated from day one is I never felt like an intern. I was always a team member. Both my team and my manager fully trusted me to get my work done and recognized my value add. Throughout the Army, the people I worked with were my lifeline. We truly cared about each other. Being a part of a team and contributing to it helped me perform my best and secure a permanent position at Workday. I could’ve looked for a different gig, but I knew this team believed in me. The team and the leader I work for have been huge in my success here. Veterans often face barriers switching from the military to the corporate world. Why should companies hire a veteran? There are so many reasons to hire a veteran. Sometimes, I think people have this idea that military service members are like robots, when in fact, people in the service are extremely flexible and adaptive. In most situations in the military, it’s a really fast-paced, intense working environment, which means there are high expectations to get the job done correctly the first time. When you give a military veteran a task, they will see it through—and they will do it with a second-to-none work ethic. Hiring veterans also allows teams to gain different perspectives in their own problem-solving. In the end, new and diverse perspectives lead to more innovation and success. If you or someone you know are interested in joining CAP, apply here.